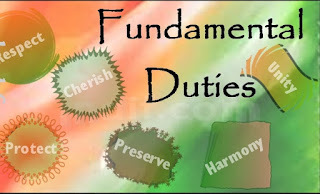 Originally, the constitution of India did not contain any list of fundamental duties. In other words, enjoyment of fundamental rights was not conditional on the performance of fundamental duties. The Fundamental Duties of citizens were added to the Constitution by the 42nd Amendment in 1976, upon the recommendations of the Swaran Singh Committee that was constituted by the government earlier that year. It was on the Soviet model that fundamental duties were added to the Indian Constitution by 42nd amendment of the constitution in 1976. Originally ten in number, the Fundamental Duties were increased to eleven by the 86th Amendment in 2002, which added a duty on every parent or guardian to ensure that their child or ward was provided opportunities for education between the ages of six and fourteen years. Amendment Act, 1976. It encompasses Part IV, Article 51A enumerating eleven Fundamental Duties of the Citizens of India. (k) who is a parent or guardian to provide opportunities for education to his child, or, as the case may be, ward between the age of six and fourteen years. Every citizen must acknowledge his/her responsibility to perform fundamental duties. 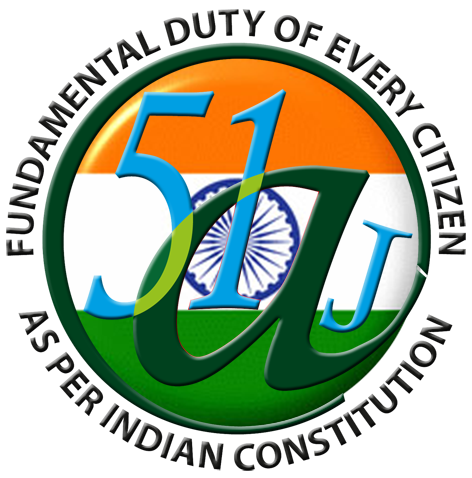 The fundamental duties enumerated in Article 51A constitute a constant reminder to the citizens that they have duties in building up a free, egalitarian, healthy and responsible society. These are expected to act as damper to reckless and anti-social activities on the part of some individuals. India is a multi-racial and multi-religion country. Such a vast democratic country like India can prosper only when the citizens of this country respect its integrity and promote cultural harmony. Environmental pollution has become a great cause of concern, not only for Indian, but for the entire humanity. Unless, every citizen takes the pledge to keep our environment free from pollutants, there remains the threat of undesirable consequences. The inclusion of providing opportunity for education for children as a Fundamental duty is a big step forward towards safeguard of human-rights and abolition of social injustices. According to the famous constitutional expert D. D. Basu, the constitution does not make any provision to enforce these duties automatically or any sanction to prevent the violation of these duties by the citizen. However, it is expected that if a law is enacted by the legislature to enforce these provisions, it shall not be declared unconstitutional on the ground of its inconsistency with the provisions of Article 14 and that of Article 19. According to him, these provisions would act as a warning to all those who does indulge in not paying due regard to the constitution and destroying public property. The Supreme Court may issue such warning to citizen to take these provisions seriously. The legislature may also enact laws to enforce these duties. In fact, there are already many laws which directly or indirectly enforce these duties. For example, there is law for the protection of public property as well as environment and animal species. However, the Supreme Court, in Surya Vs Union of India (1992) case, ruled that fundamental duties are not enforceable through judicial remedies by court. In Bijoy Immanuel Vs State of Kerala (1987), the Supreme Court overruled the decision of Kerala High Court and decided that though to Constitution provides it to be the duty of citizen to respect the National Anthem, it does not provide that singing of the National Anthem is part of such respect. Even a person, while standing during the singing of National Anthem (without himself singing it) can show respect to the National Anthem. 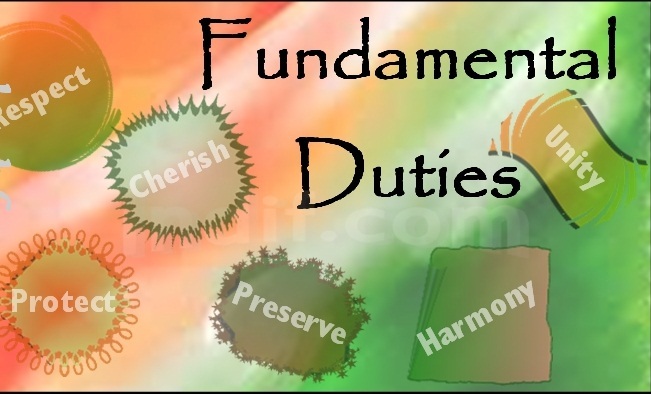 Fundamental duties are in the nature of a code of conduct. Since they are unjustifiable, there is no legal sanction behind them. As one will find, a few of these duties are vague. For example, a common citizen may not understand what is meant by ‘composite culture’, ‘rich heritage’ ‘humanism’, or ‘excellence in all spheres of individual and collective activities’. They will realize the importance of these duties only when these terms are simplified. A demand has been made from time to time to revise the present list, simplify their language and make them more realistic and meaningful and add some urgently required more realistic duties. As far as possible, they should be made justifiable.